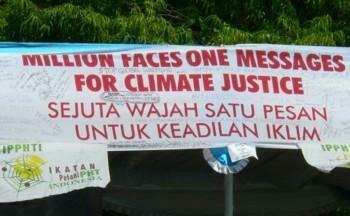 A DTE workshop at this year's UK climate camp drew attention to climate change concerns in Indonesia. As the intergovernmental process to agree a post-Kyoto climate agreement moves towards the 2009 deadline, Asian civil society groups meeting in Bangkok in July have called again for climate justice. Global anti-poverty campaigners have also criticised the richest countries of failing to live up to promises of strong commitments on climate change at June's G8 meeting in Hokkaido. For indigenous peoples like the Meratus Dayak of South Kalimantan, farming is not only a means to obtain food, but also forms part of the customary (adat) rituals that have been passed down the generations. Concerns about food security worldwide are growing as rice prices have more than doubled in many countries over the last year and global rice stocks are the lowest for decades. Meanwhile the Indonesian government needs to consider how to increase rice production and to protect the food supplies of the poor. The United Nations Food and Agriculture Organization voiced concern when international rice prices rocketed to a 20-year high in late March with the global benchmark price at over US$500 per tonne. Large areas of Papua's rich and diverse forests are being targeted by Indonesian and overseas investors for conversion into oil palm plantations. At the same time, discussions are in progress to reserve large areas of Papua's forest to generate carbon credits for trade on international markets.